Carbon is the most important nutrient for aquarium plants. Approximately 40% of the plants dry mass consists of this vital element. Carbon, or more precisely, carbon dioxide (CO2), is usually lacking in an aquarium - the result: poor plant growth. And when the plants grow poorly, the unwanted algae take their chance. With this test you can easily determine whether the aquarium contains enough CO2. 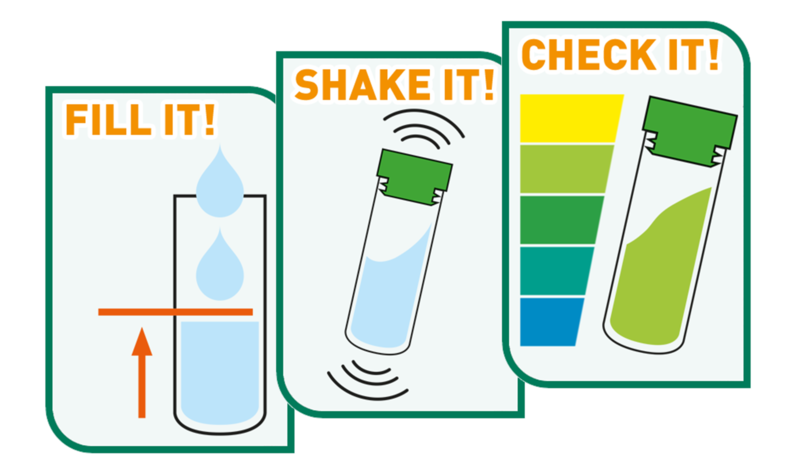 Simply fill the aquarium water into the test tube, give it a quick shake and seconds later the color reaction will reveal the result. In case the aquarium contains too little CO2, the use of a CO2-fertilization system is recommended. The plants will reward it with lush growth, strong leaves and rich colors. And the annoying algae will no longer have much of a chance. Tip: When using a CO2-system, we recommend the Dennerle CO2 long-term test Correct +pH for permanently monitoring the CO2-content in the aquarium. Fill test tube half full with aquarium water. Seal tube with the cap. Shake several times until reagent is dissolved. Compare color of the solution with the color fields. Securely protects CO₂ devices from backflowing water. With permanently elastic, CO₂ window special membrane.